After a day of drama on Capitol Hill, inquiring non-legal minds want to know whether a case can be made that President Donald Trump obstructed justice with respect to the FBI’s investigation into Russian spies meddling in last year’s election in general, and former Trump National Security Adviser Mike Flynn having ties to Russia, specifically. Assuming that it is even possible for a sitting president to be charged with a criminal offense (the Constitution is ambiguous as to whether a sitting president can get locked up), what is the likelihood that Trump would be convicted if charged? At the time President Trump made those discursive remarks to Comey, he knew full well that Flynn was under suspicion of myriad illegal or unethical acts relating to Russia. As such, the issue is with Comey reporting directly to AG Sessions, and Sessions serving at the pleasure of Trump, was Trump’s comments an “aww shucks, I really like Flynn and am worried about my BFF” moment that lacked persuasive (read-criminal) intent? Or was Trump doing the old Washington two-step, with a wink and a nod and the subtle implication that Director Comey should look out for his loyal friend, Flynn, by dropping the investigation? At this juncture, a definitive answer is hard to come by. For lawyers, each word in a statute matters and in this instance, the critical word that a Trump prosecution would hinge upon is “corruptly.” That is the “mens rea” or specific intent that must be delved into, which is whether Trump knew and intended for what he said to Comey to lead to a cessation of the Flynn investigation. Trump’s detractors will argue “Yes, surely he knew–why else would he send Sessions and Priebus away before making the comment?” Such is a very reasonable conclusion, although I caution that having watched Trump on the campaign trail and in office thus far, I do not get the sense that he is bright enough to deliberately plot; Trump strikes me as one who makes decisions based upon “feelings” and raw emotion, thus his thinking that since Flynn was loyal to him, as a friend, that if he could merely vouch for his friend, perhaps it could help his friend? Donald Trump Jr tried to weigh in on the last point and defend his father via Twitter today, saying that having known his dad for 39 years, if his dad was issuing an order to an underling, that said underling would know it. While that sounds nice and all lovingly filial and whatnot, most employees are reticent to say “no” when their bosses make requests, be they subtle or overt. When the boss is theoretically the most powerful man in the world, even subtle comments become magnanimous and are subject to closer scrutiny as to what the Commander-in-Chief actually meant. Therein lies the wisdom in Comey’s decision to jot down a contemporaneous memo of the meeting and Trump’s comments, a memo that would certainly serve as evidence in the only quasi-legal proceeding that in actuality could occur at this point–which is impeachment. Yes, the “I” word is still on the table and yes, one could credibly argue that Trump’s comments about a serious matter like Russia meddling into the 2016 election are far more serious than prior impeached presidents Bill Clinton lying about an extra-marital affair, or Richard Nixon implying that the then vacant FBI Director’s job could be given to a judge that was considering a case against one of his underlings. But the fact remains that Trump is safe for now because he has a Republican controlled Congress that is not hardly about to begin any impeachment proceedings and even if for some reason they chose to do so, there are not 67 votes in the Senate to have Trump removed–assuming the House voted to impeach by a simple majority. Still, the one constant is that not now does not mean not ever, and one thing that Trump does to his great detriment is to fire off comments via Twitter that confirm things that his lawyers and his knowledgeable supporters know that he should clam up about. 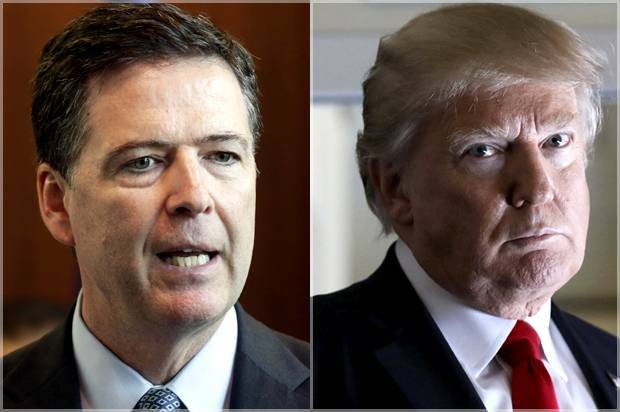 It would not shock me at all to see Trump fire off more defiant comments about what he said to Comey, when he said it and what he meant, all to appear tough as opposed to the unknowing Village Idiot. The problem is that the more he plays tough by saying Comey had to go because he was not “loyal” and would not end the Flynn investigation, the more evidence that he provides that his intent was “corrupt” and ultimately criminal.